The hotel industry is a major part of the hospitality industry. In this post, we have covered this industry in general. We have provided an overview of the Hotel industry in this post. This post makes an effort to quickly define the hotel industry, discuss the evolution of this special industry and then cover its major segments, types and aspects. This article ensures not to go into deeper details to keep this post short and informative. So, all the hoteliers and the travel enthusiasts out there, let’s begin the fun with this interesting take on the hotel industry in totality. It is indeed interesting on how the hotel industry has evolved from small Inns to the multi-million dollar business of today. So, here is a quick overview of the revenue this special industry generates. For a detailed report, please visit the Global Report Section HospitalityNet. The amount depicted above is in Billions. The Global Hotel Industry revenue in 2016 stands approximately at a staggering value of $550 Bn and it has seen an increase in 2017 and 2018. And, we have not included travel and tourism which heavily depend on this industry. So, discussing this special industry is certainly not a waste of time. Isn’t it? For those who would love to see more numbers about the Hotel industry can visit our blog post on Hotel Industry Analysis and statistics. In order to define the Hotel properly, we must also know the various segments of the Hotel industry. 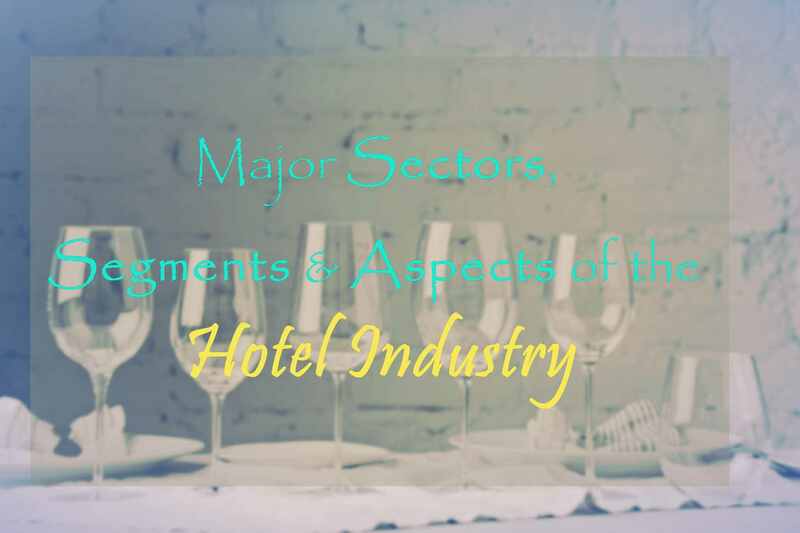 There are 5 Major Sectors of the Hospitality industry which we have covered in another post on this Hospitality Portal. The hotel industry is one industry which has a clear overlap with most of these sectors of the Hospitality industry. The Hotel industry looks like a conglomerate of all these sectors. In this post, we have covered more about the uniqueness and vastness of the Hotel industry. Also covered in this post are the major segments of the hotel industry, aspects of the hotel industry and unique points that make the Hotel industry quasi Hospitality industry. While we could have made this an epic post worth thousands of words, we have ensured that we make it a bullet list with links to detailed posts on each individual points. So, whether you want to skim these points or do an in-depth study, you are going to find this article interesting. Who doesn’t know that? Isn’t it? It is an establishment that provides accommodation, meals and other services to travellers and tourists. Well, that’s what the Wikipedia says. But, is it all that it takes to define a hotel? Well, there is always a yes and a no. 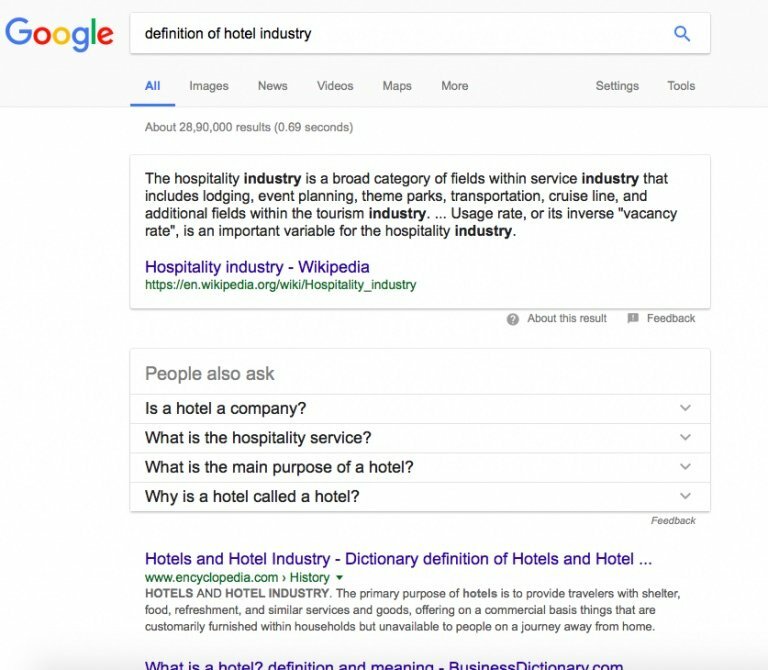 If you search ‘Definition of Hotel Industry’ on Google, you get the results for the ‘Hospitality industry’ instead as shown in the search image below. So, even Google finds it difficult to differentiate between the Hospitality industry and its integral part, ‘The Hotel Industry’. There must be something more to the definition that can help Google show better results in the future. We can add commercial, customer service and price to this definition and of-course hospitality. Why fret so much over the complete overview of the Hotel industry? Is the Hotel industry that important? When we discuss the hotel industry overview, it is equally important to discuss it’s segments which are listed below. Full-Service Hotels – These include the Resort hotels and 4* and 5* hotels. Select Service Hotels – These include several 3* and 4* hotels, Bread & Breakfasts, Inns, Airport Hotels etc. Limited Service Hotels – These include Hostels, Capsule hotels. Motels, 1* and 2* Hotels etc. Boutique and Themed Hotels- These include Boutique Hotels, Cruise Hotels, Theme Park Hotels, Casino hotels etc. So, we have defined a few segments to get to a clear definition of the Hotel. But, while exploring the segments we have noticed that there are several hotel types within each segment. So, it’s also worthwhile to quickly mention the various hotel types. Isn’t it? There are numerous types of hotels in the world. You would be amazed by the variety that this industry provides to all the travellers. Have a look! The expanse of the Hotel industry is limitless. A Hotel when defined as an established providing paid lodging and boarding services to travellers, does only half justice to the essence of the hotel industry. While the above definition is good for a hostel but this definition would infuriate the passionate boutique hoteliers or hotel entrepreneurs who believe hotels are more about hospitality & service than it’s about lodging and food. Well, we will have to agree. We pay more for the ambience at times than for the food. Finally, to have an all-round understanding of the Hotel industry, it is also important to have a look at the various aspects that make the hotel industry. The hotel industry size is large to include broad categories within the industry that each has unique characteristics. Regardless of the sector, one thing is clear; customer service remains to this day the backbone of the entire hospitality industry. All the important segments of the hotel industry such as food delivery and care are also driven primarily by customer support. Careers in the hotel industry can be extremely rewarding, however, they are also challenging and fast-paced, which can be overwhelming for most people. This industry is a lot broader than other industries, and it is related to nearly every other profession on earth. While this industry is very broadly classified, it has some defining aspects that are very important. As mentioned earlier, the most vital aspect of the hotel industry revolves around customer satisfaction. While customer satisfaction is important for any successful business, the success of the hospitality industry relies solely on whether the customer is happy or not. In this age of the Internet, where social media platforms are king, an unhappy customer can be the source of an unnecessary headache. To prevent bad reviews, which are the death of every business, the hotel industry must do everything to ensure satisfaction. Another vital aspect that defines the hotel and the hospitality industry is the reliance on other people’s disposable income and free time. Because of this, a lot of businesses in the hotel industry, whether they have to do with accommodation or transport, are targeted towards people that have extra income to spare, rich patrons or people that have free time for rest and relaxation. During economic downtimes such as the recession, the hotel industry typically suffers because patrons are forced to redirect their income to other central issues. Lastly, the hotel industry is also characterised by themes. Many hotels, especially the smaller variety opt to stick to a theme that can help to attract customers. For instance, a hotel can have a Mediterranean theme as a way of appealing to customers that prefer that type of food. Not only do different and unique themes help to attract more business, but they also help to set one business apart from another. For a business to be successful in the hotel industry, it must have an authentic theme. Hope you found the overview of the hotel industry interesting and informative. Hotel’s definition is indeed complicated. The range is huge and it is extremely difficult to provide a complete hotel industry definition. We have tried to complete the Hotel definition by adding a few tenets to the definition by Wikipedia. But, even this doesn’t cover everything of the industry. So, it is these Hotels or establishments and people working or attached to these establishments constitute the hotel industry. Hope this quick yet comprehensive hotel industry overview article kept you engrossed for a while. Keep on exploring more on the hotel industry and the hospitality industry on a whole through hundreds of articles on this portal.